The Ellendale Neighborhood is located at the western edge of the city of St Louis. 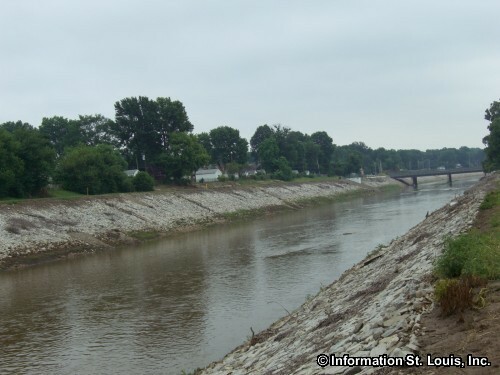 The River Des Peres is a prominent feature in Ellendale and runs right through the middle of the neighborhood. The boundaries of Ellendale are Manchester on the north, Interstate 44 on the south, Hampton Avenue on the east, and the City limits on the west. Surrounding neighborhoods are the Lindenwood Park and Clifton Heights neighborhoods to the southeast, Franz Park and Clayton-Tamm neighborhoods to the north, and The Hill Neighborhood to the east. Not only does the River des Peres cut through the neighborhood, so do two railroad lines and the railroad yards that come with them. Because of this, most of the residential areas of Ellendale are west of the River des Peres, along the city limits. The St. Louis Public Library has two branches located conveniently to the Ellendale Neighborhood, the Marketplace Branch is located on Manchester Road in Franz Park and the Machacek Branch is on Scanlan Avenue in Lindenwood Park. The Francis R. Slay Park, formerly the Ellendale-Arsenal Park, is located in the Ellendale Neighborhood. The park was dedicated in 2009 to the memory of Francis R. Slay, a lifelong South St. Louis resident and a 45 year Democratic Committeeman of the 23rd Ward of St. Louis City, which is adjacent to the park's location. The park features a playground, two baseball fields, a soccer field, a one-mile walking trail, one tennis court and nine total acres of parkland. St. Louis Public School District serves the residents of the neighborhood. The district has several schools located nearby. Mallinckrodt Academy of Gifted Instruction Magnet School is on Pernod and its specialty is "gifted" for grades Preschool through 3rd and "General Academics" for 4th and 5th. The Mason School of Academic and Cultural Literacy Elementary School is located on Southwest Avenue in Clifton Heights Neighborhood. The Wilkinson Early Childhood Center Elementary School is in the Franz Park Neighborhood on Prather. And the Gateway STEM High School, a public Magnet school, is located in the Hill Neighborhood on McRee Avenue.